The secret to immaculate landscaping? String trimmers. Whether you use a gas string trimmer or an electric string trimmer, you can achieve a picture perfect yard – just be sure to use the right trimmer shaft model for the right task. There are two types of string trimmers models– curved shaft and straight shaft. Curved shaft models are lighter weight and best suited for smaller yards and more intricate work. Straight shaft models work better for larger yards, and for reaching under decks and around obstacles. Get a sense of the sizes and capabilities of both curved and straight shaft string trimmers here. Edging your garden beds makes them look cleaner and more professional. Position the trimmer at 90 degrees to the area you’re edging. 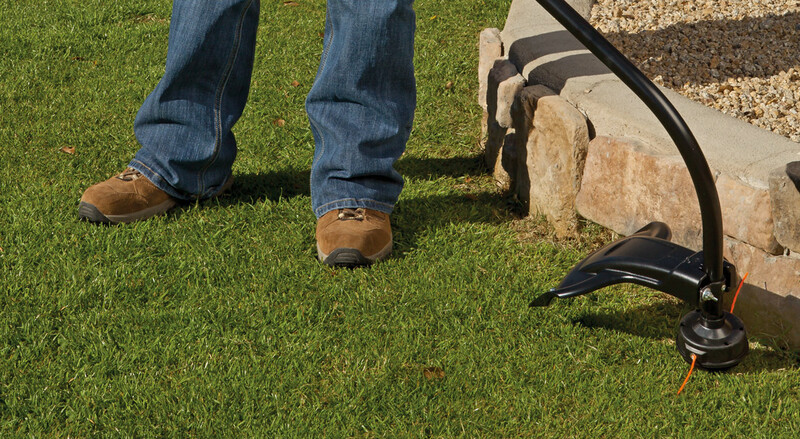 Move the end of your trimmer slowly from left to right along the edge of your garden bed. You should notice a nice vertical edge being created as the trimmer cuts through excess grass and debris. As with mowing, don’t cut more than one-third of the grass height to avoid scaling and damage to your lawn. If you want to make quick work of long grass and weeds that pop up in your lawn and gardens, hold the spinning end of the trimmer parallel to the ground and slowly walk with the trimmer over the overgrown areas. You may want to cover a few areas and then stop to clear the cuttings using a yard bag or compost pile. For really overgrown yards, this makes the process a lot more manageable. You’ll also want to watch out when trimming near trees and shrubs, because string trimmers are powerful enough to remove and fling bark. If you’ve been wondering how to achieve a more perfect-looking yard, a string trimmer may just be the missing piece of equipment in your outdoor arsenal.